A disgruntled man named Kyle (Jack O'Connell) takes Lee Gates (George Clooney), the showy host of a television finance program, hostage after a stock Gates endorsed takes an $800 million dollar nosedive overnight. Kyle had invested all of his money in this stock, only to have every cent taken from him in the blink of an eye. Now, Kyle's only demand is the truth about what went wrong. Directed by Jodie Foster and starring George Clooney, Julia Roberts, and Jack O'Connell, "Money Monster" is a dramatic thriller about the corruption and backdoor dealings of those on Wall Street. 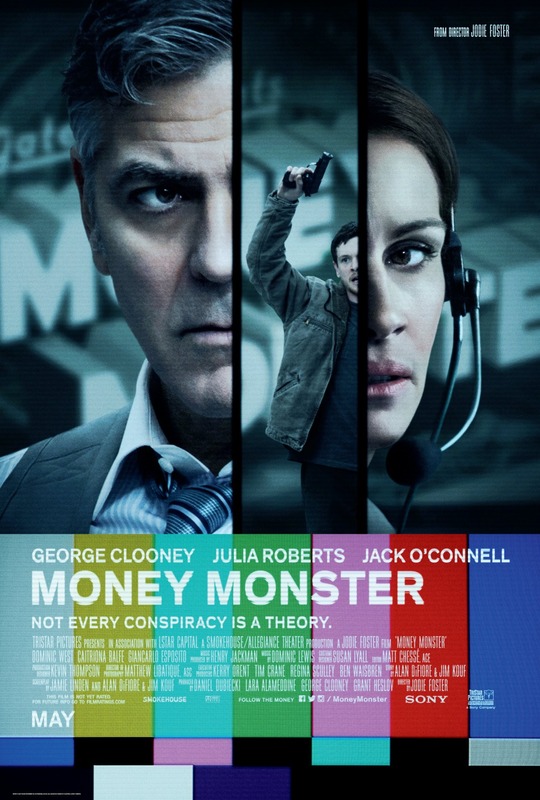 George Clooney plays Lee Gates, the flamboyant, flashy host of a financial advice show called Money Monster. Gates has recently endorsed the purchasing of stock from a company called IBIS. After IBIS's stock has lost $800 million dollars, a delivery man and investor in IBIS named Kyle Budwell, played by Jack O'Connell, shows up on set with a gun and a bomb attached to a vest looking for answers. Luckily for Lee, he has the voice of his level-headed director, Patty, played by Julia Roberts, in his ear the entire ordeal to help keep him calm. 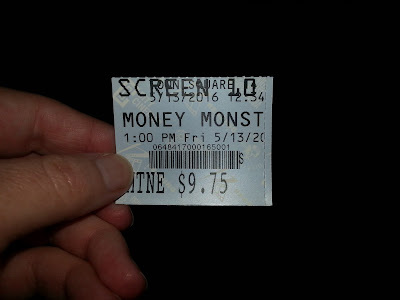 To be honest, we weren't really looking forward to seeing "Money Monster." We got more than burnt out on the trailer since it played in front of almost every film we have seen since January, and this is not an exaggeration. Now that we've finally seen it, we must admit we enjoyed it for the most part. The film is really tense, especially the first two acts. It does its best when it serves as an edge-of-your-seat, nail-biting, tension-filled thriller when you don't know what's going to happen or if anyone will make it out alive. The first two acts are entirely contained within the walls of the studio of Money Monster, Lee Gates' television show. These scenes are really great and work because of a few things. George Clooney is, of course, one of the main reasons. His vivacious, fast and smooth talking television persona must be put on hold during the hostage crisis. Unlike the trailer would have you believe, Gates is deceptively caring about Kyle's predicament, especially since it turns out Gates is the one who put his name and signature on the authorization of a bad investment. This role is not really a stretch for Clooney, though. The guy is pretty damn likable, so we can't help but believe him since he's essentially playing himself as a television financial advisor/entertainer. Juila Roberts offers a good performance, too, and looks to be a woman who has full command of the situation despite being in clear danger. It's always nice to see Clooney and Roberts on screen together. They drive this story forward in combination with some excellent smaller performances. Walt Camby, played by Dominic West, the smarmy, suspiciously absent CEO of IBIS, and Diane Lester, played by Caitriona Balfe, the talking head of IBIS during the crisis, are also essential to figuring out the mystery behind the tanked stock. Now, for the bad parts about this movie. We know a lot of people have taken a liking to relative newcomer Jack O'Connell, but we are not entirely sold on him. We have been very underwhelmed by his performances here and in 2014's "Unbroken," but still, he manages to get the job done and is serviceable in this role as a disgruntled, pissed off investor who has lost all of his money. The problems mostly lie in its script and the third act of "Money Monster." The script is all over the place at times, putting jokes where they don't need to be in a few misguided attempts at humor. These tonal shifts were quite jarring on more than one occasion. The movie works best when it is a straight thriller, and it seems to move off course here and there. Also, "Money Monster" falls victim to some of the same genre tropes to which we are accustomed. Once these characters leave the studio, things start to lose focus, fall apart, and it all gets to be a little over the top. The final portion of the film is dedicated to both the climax and the nation's reaction to what happened during the hostage situation. We agree that the media and public reaction is absolutely accurate, and that people would waste no time commenting about it online, or try to take selfies in the streets where the events occurred, or even make a meme or two about the whole fiasco. We do appreciate how the ending is handled and we believe it is entirely accurate compared to what might play out if the situation happened in real life. In the end, "Money Monster" shows that Jodie Foster has a lot to offer Hollywood as a director. This movie won't win any awards or critical acclaim, but it will most likely keep you engaged and on the edge of your seat throughout most of, if not all, of its run time. It's harmless enough, and is a decent watch for a Friday afternoon.